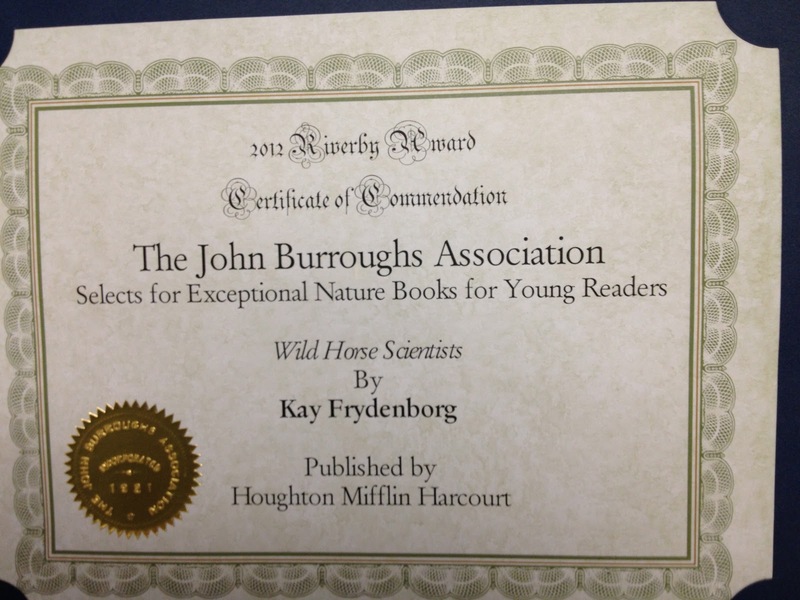 After lunch and the award presentation, Thor Hanson, winner of the John Burroughs 2013 award for a distinguished natural history book (for his fascinating Feathers: The Evolution of a Natural Miracle) gave an engaging talk about how he came to write the book, and then it was on to book-signing! In addition to Thor Hanson and the John Burroughs folks, I got to meet fellow author Laurie Lawlor, who won for Rachel Carson and Her Book That Changed the World. We all signed one another's books, as well as many more books, and had a great time. The great news is that the wild horse population on Assateague Island, Maryland, is now down to 103—just three horses away from the goal! This will make the Assateague horses the first wild population to be reduced and maintained entirely with PZP, and NO removals or gathers! Yay! 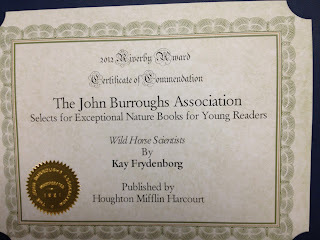 This truly represents the fulfillment of Jay Kirkpatrick's life's work, as I wrote about in my book. In other good news, Jay reports that the BLM in Billings, Montana has just released a new management plan for the Pryor Mounain wild mustang herd which is based on the successful Assateague protocol, after years of resistance from both the BLM and the advocacy group, the Cloud Foundation, which has done a complete reversal and now strongly supports the PZP program! I'll keep you posted as I learn more. As much as I love talking about these wild horses, I'm now up to my ears in researching and writing my next book for Houghton Mifflin, which is about . . . chocolate! I know, kind of a departure from my usual animal-centric topics, but delicious! (Yes, I've been succumbing to chocolate cravings way more than usual since working on this book. But hey, chocolate is good for us! Just wait till you hear!) The book is slated for publication in the spring of 2015, and I have a lot of work to do before then. But it's pretty fascinating. And after chocolate, I have another project lined up. This one will be about dogs, and how we humans and our dogs have evolved together through history, and how that relationship has changed both our species. I can't wait to really dig into this one. So I was trying to think about how I could tie chocolate and dogs together in this blog post, and the obvious thing is, don't! 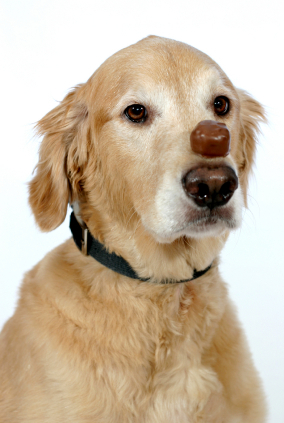 As most of us know, chocolate may be good for us humans (at least some kinds of chocolate, in, um, moderation), but chocolate is bad for dogs. Especially the kind—dark chocolate—that's good for us people! Bummer. The culprit is mainly one of the many chemical components of chocolate, theobromine, which dogs simply can't handle as well as we can because their bodies process it much more slowly. The same goes for the lesser amounts of caffeine found in chocolate. It turns out that, as closely as we and our dogs have evolved together throughout history (and new studies suggest that dogs actually did experience evolutionary changes making it possible for them to digest some other things we like, such as grains), there are many foods we love that can be harmful and even lethal to dogs—including, besides chocolate and cocoa, also grapes and raisins, onion, garlic, and macadamia nuts! So hold the leftover pizza, no matter how much your dog begs for it! And while it's okay to enjoy chocolate every day if you like—think of it as a health food!—never share it with your dog. (Finn and Junie asked me to mention that pizza crusts are safe enough. Because of that little wheat-digesting evolutionary change I mentioned!) Lots more on that to come . . .
What a great good-news filled post! Chocolate and dogs are two of my favorite topics (that's separately, which though you wrote the same above, I don't think it can be overstated : ) ). I so look forward to reading your approaches to these topics. 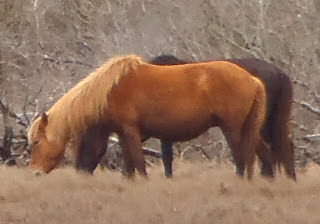 I especially liked reading an update from Assateague and seeing Alison Turner's photo of the pregnant mare. Congratulations to Jay Kirkpatrick! Thanks, Karin! I'm so glad you stopped by, and also glad you're fond of my topics! Trying to keep them separate in my mind, and definitely in my house, but couldn't resist that guy in the picture above. The award looks GREAT Kay! I am pleased to hear of the unfolding success of the PZP program on Assateague Island. However, my condolences to dogs - a life without chocolate! That's just, well... a dog's life! Good luck with the chocolate book. I look forward to seeing some of the drafts.